How much do you know about Little House on the Prairie and Laura Ingalls Wilder? 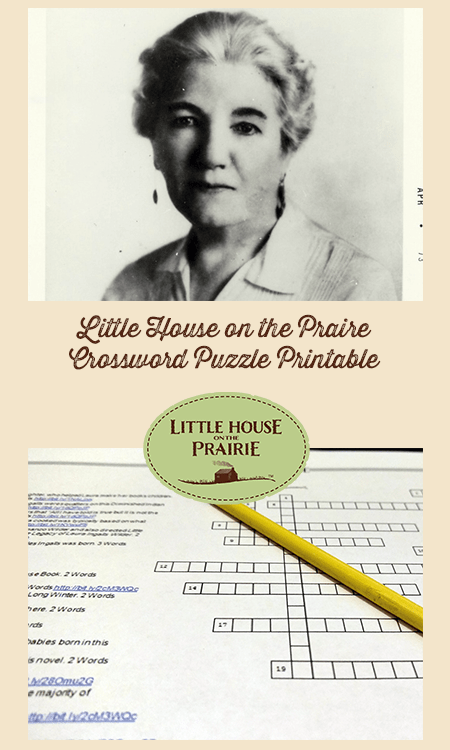 We have a fun way for you test your knowledge and learn something new with a Little House on the Prairie Crossword Puzzle printable. You can download the Little House on the Prairie Crossword Puzzle printable here. Below you’ll find some clues to the answers and links to additional information. This would make a great way to supplement a unit study about Little House on the Prairie in school. You could also use it as a fun activity at a Little House on the Prairie inspired party. When you’re ready to check your answers, download the Answer Sheet PDF or check out the resources linked below. 2. Laura Ingalls Wilder’s daughter who served as her mother’s editor. Laura and Almanzo had one daughter who became a well-known writer in her day, helped inspire her mother to write newspaper columns, and eventually edited her mother’s Little House books. Her great grandfather, Samuel Worthen Ingalls, was a published poet. 3. In 1870, the Ingalls were squatters on this Diminished Indian Reserve. Laura Ingalls Wilder’s family first traveled from Wisconsin through Missouri and then settled near Kansas. Their encroachment on the Native American land led to their next move out of Indian Territory. In her book, Little House on the Prairie, Laura describes her encounter with these Native American people and how a brave chief saved their family. 4. She once told readers: “All I have told is true but it is not the whole truth.” Her books are based on her life and family experiences, however, they are considered historical fiction. The stories are beautiful descriptions of a unique time in history. Her attention to detail draws readers in and speaks to us. See more of our favorite quotes by Laura Ingalls Wilder. 5. What Ma and Laura cooked was typically based on what traditions? In this essay by Sarah Uthoff we learn a lot about the history of culinary skills among pioneers of this era. While many influences factored into what they cooked, Ma’s upbringing was a huge factor. See all the recipes inspired by Little House on the Prairie. 7. This actor played Almanzo Wilder and also directed Little House on the Prairie: The Legacy of Laura Ingalls Wilder. This one-hour documentary goes beyond the books to show insights into the author, Laura Ingalls Wilder, and her life. Her personal story as a wife, mother, and writer is a fascinating one, especially when narrated by this actor. 11. The town and state where Charles Ingalls was born. When we meet the Ingalls family in Little House in the Big Woods, they are preparing to leave Pepin, Wisconsin. But Charles and Caroline’s stories began far from Pepin. Learn more in this glimpse at Charles Ingalls’ birthplace. 1. Laura Ingalls Wilder’s second Little House novel. It is in this book that we get to experience part of Almanzo’s childhood and hear about a very different upbringing than Laura’s. The contrast is stark but insightful, and young children especially love to hear about the mischievous fun Almanzo and his siblings had, as well as the animals Almanzo worked with. 6. What is the name of Laura’s mother? Laura wrote very highly of her mother, both in the Little House books and in several newspaper columns and essays. Her mother grew up in a wealthier family, but once her father died they grew destitute at times. However she valued family above all and the courage she brought to the family, described by Laura’s details, has made an impact on generations. 8. Where the Ingalls family spent the “long winter.” The hard winter described by Laura in The Long Winter was not just the stuff of fiction. It was a real climate event that has even been studied by meteorologist Barbara Mayes Boustead. 9. Laura spent the first years of her life here. This area is the setting for Laura’s first book, Little House in the Big Woods and is her birthplace where she spent the first years of her life. It is also the beginning of the Laura Ingalls Wilder Historic Highway today. 10. Original title of Laura’s first draft. Many fans of Little House on the Prairie don’t realize that Laura didn’t set out to write the books in their current form. Her first draft wasn’t geared towards children and, as a result, includes some stories and situations that didn’t find their way into the series of books for children and young adults. This manuscript was recently published in an annotated form under the excellent editing of Pamela Smith Hill. 12. Caroline was one of the first Caucasian babies born in this area. Caroline ‘Ma’ Ingalls grew up in a merchant family and her father was a trader who often did business with the local Native American population. When Caroline’s mother remarried, the family moved to Wisconsin where she would eventually meet Charles Ingalls. 13. Pa’s fiddle becomes a character in and of itself in this series of beloved children’s books. Pa’s fiddle may well be considered one of the primary characters in these books. The way Laura describes the music brings it to life for us. Through celebration, sadness, and triumph, Pa’s fiddle plays a soundtrack through Laura’s stories and her life. 14. Pa’s first and middle name. We meet him simply as ‘Pa’ through Laura’s stories and detailed writing. She brings his spirit to life and tells us stories from his childhood that she remembers hearing as a girl. He provided for the family through farming and various odd jobs, moving many times until his retirement in De Smet, South Dakota. 15. Near what town did Laura and Almanzo live out the majority of their years? Laura and Almanzo married in 1885 and by 1894 they had purchased 40 acres near this small town in the Ozarks. They lived here the remainder of their marriage and it is in this home site that the Little House books were written. 16. The daughter born after Laura and named for Ma. This younger sister was the baby in many of the books. She grew up to become a teacher first and later entered the newspaper trade. She was both a printer and a journalist, as well as a respected editor. 17. The name of the award the American Library Association now gives out in honor of Laura Ingalls Wilder. Laura Ingalls Wilder became an American fixture through her literary works. The series remains popular to this day and has been translated into many languages. In 1954 the American Library Association created a literary award in her name. 18. The location of the “Iowa College for the Blind” that Mary attended. Mary Ingalls, Laura’s older sister, went blind both in the Little House books, and in the Little House on the Prairie television series. But in real life, the “Iowa College for the Blind” (later renamed the “Iowa Braille and Sight Saving School”) that Mary attended was located in this city in Iowa. We have other great printables for Math, Language Arts, Preschoolers, and even some that are just for fun! You might also enjoy our recommended reading list for adults, young adults, and children. For more Little House on the Prairie crafts, printables, and ideas, be sure to subscribe to our monthly newsletter.